From left to right: Henrique Santos, Marta Neves, Hugo Valentim, Teresa Carvalho, Rafael Couto, Mourad Bezzeghoud, Jorge Carvalho, Fernando Carrilho, João Fonseca, Carla Patinha, Fernando Lopes, Rui Fernandes, Luís Matias. On March 26th, 2018, C4G implementation commission had its first meeting to present and discuss the steps for C4G implementation. 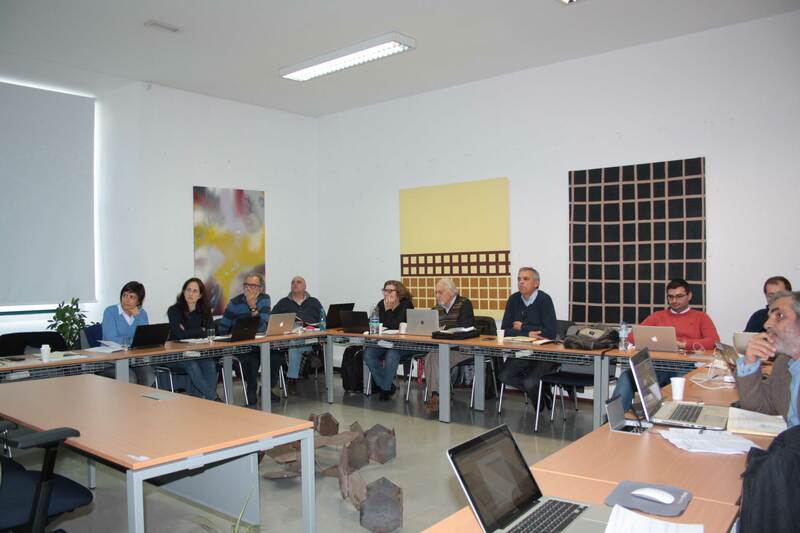 The meeting was opened by João Fonseca, technical director, who started explaining C4G project including its description and intelligent specialization priorities domains (ENEI). According to Fonseca, C4G implementation services follows three stages: preparation, construction and operation. The first year (June 2017/May 2018) is dedicated to preparation, also serving to establish details of the open access policy, specific products and services to provide, structure of thematic nodes, architecture of the e.infrastructure, active engagement of stakeholders, mechanisms that ensure effective and efficient collaboration inside C4G, details of the work plan (including clarification of participant roles) and hiring of staff (including the technical director). About the duration of the construction phase, Fonseca pointed out that it depends on the intra-disciplinary integration maturity for each Working Group (WG). “We expect that the WG1, WG4 and WG7 thematic nodes will start to operate in 2019, other will follow”, asserted the technical director highlighting that e.infrastructure will become operational in 2019. Fonseca also listed the services that will be provided by C4G: access to equipment (including portable tools) and laboratorial facilities; access to data repositories; access to data mining, modelling and visualization tools (hardware and software); data reduction analytical work for third parties; scientific consulting for private and public entities; calibration services; advanced training and knowledge transfer; chemical analysis of soils, waters, plants and rocks; geomechanical characterization of solid materials. From left to right: Carla Patinha, Marta Neves, Mourad Bezzeghoud, Luís Matias, Teresa Carvalho, Fernando Carrilho, Jorge Carvalho, Hugo Valentim, Rafael Couto, Henrique Santos. Concerning C4G’s 10 Lines of Action (LA), each representative brought up some relevant points and questions. How is C4G going to provide the services? For whom C4G is going to provide the services (thesis, researches, market)? What will be provided? Is C4G going to rent the equipment? There is maintenance cost for the equipment. How to precify? Which are the utilization rules for the equipment? Will C4G compete with the private companies? Isn’t this competition disloyal? Should C4G issue invoices? Should C4G have financial autonomy? Will C4G provide services where no one else lends? Concerning C4G legal identity, should it be an IPSFL (non-profit private entity)? Should it become a CoLab, with the corresponding FCT “seal”? Moreover, this session also claimed for a uniformization for the resources, which must be done after collecting the data on who is acquiring the equipment and the rules of use. Only then will it be possible to do the harmonization to standardize the resources. Short term specialization courses for scientists and engineers (the ones that are not belonging to university). Scientific and technical support for master’s degrees, doctorates degrees and PhD. Analysis, control and essays of geological process (geomaterials). Scientific and technical counselling for non-academics. Training courses for pre-university teachers. Training courses for professionals: management of natural hazards, georesources and geoenvironmental. LA3: Interaction with Stakeholders, including Industry – Jorge M. F. Carvalho, the representative for this line action, presented what is supposed to be its objective: “to structure and stimulate the relationship between C4G and its stakeholders”. Besides pointing out the need to accurately identify the C4G stakeholders he highlighted that the foreseen tasks suggest the Industry as being the main stakeholders, particularly the mining industry. After making a brief outline of the current situation of the Portuguese mining sector, it was pointed out how crucial it is to define the C4G’s pipeline and its target, and the associated difficulties were brought to the discussion. Other highlighted issues: disloyal concurrence and C4G financial autonomy. LA4: Communication and Outreach – Straight forward, Carla Alexandra Figueiredo Patinha suggested the creation of brochures in order to better explain C4G, WGs, LAs and its products and services. She also gave the idea of creating a newsletter and pointed out the need of inserting more information about each WG and LA in a more descriptive way. LA5: Technical Integration of Existing Resources – Summing up, the need to create harmonized rules in order to implement the transversal activities was identified. LA6: Integrated Services for Fundamental Science – Three important issues were appointed by Mourad Bezzeghoud, the representative for this LA: to create a business plan, a dossier and a portfolio. LA7: Integrated Services for Georesources – Two issues were addressed here: to exploit the innovation and how to do it with a low cost. Gather data on the set of active faults. Create a VS30 map: proxy of the effects (seismic) of amplification. Map a seismic strain: modulation deformation using GNSS. Prepare a seismic matrix (Arraiolos line of action, for example). Rules for mobilization and intervention (earthquakes). Evaluation of seismic effects (IPMA). LA9: Integrated Services for Geo-environment – . The need to focus the actions in a Circular Economy frame was addressed. This LA partially overlaps LA7 in what concerns extractive industry residues. The recovery of raw materials from anthropogenic resources is another goal. LA10: e.Infrastructure Development and Maintenance – due to time limitations, this LA was not discussed in this occasion. Event in June for leveraging C4G – At the opportunity was presented to the C4G Implementation Commission the definition, the types and the purpose of an event. Besides, the event stages from the planning to its realization were explained. First of all, the need of defining the target (public) and objective of the event was pointed out. As a support, the need of creating media material was identified, and also the need of having coverage by the press and having the C4G website also in Portuguese. The importance of choosing a suitable place for the event was also highlighted, and what should be taken into consideration for this choice was discussed. This entry was posted in Implementation Comission and tagged analytical work, C4G, C4G services, data mining, data repositories, equipment, implementation, laboratorial facilities, modelling tools. Bookmark the permalink.